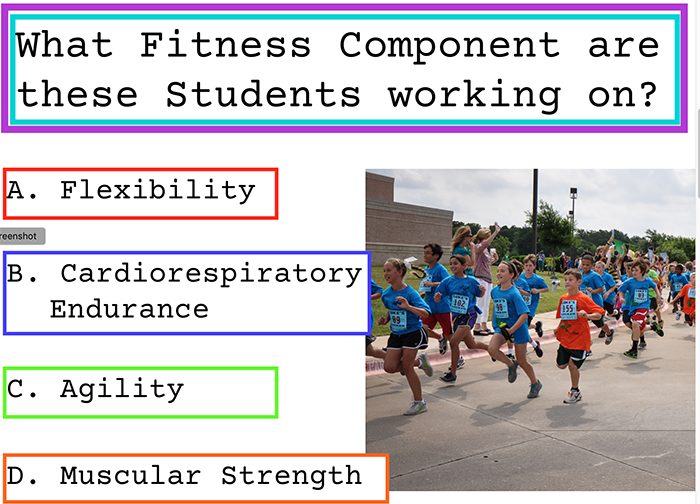 To assess the students knowledge of the Components of Fitness and the activities or exercises that the components address. These Fitness Component Assessment Cards can be answered as a quick exit ticket at the end of a class or can be used as questions for Plicker's Assessment App. Printed cards could be used as an exit ticket as children are leaving the gym. Post the questions and students will answer the questions, along with their name, on a sticky note or piece of paper. Plickers is and app that you can use with your phone or iPad to quickly learn more about what students are learning in PE. The instructor reads the Plicker question/s. Students decide the correct response and turn the plicker card to make the corresponding letter on the plicker card face up. The teacher then scans the cards with the device, held up by students. The plickers app quickly tells the teacher what students answered the questions correctly. See this Best Practice on PE Central for more information about how to use Plickers. Submitted by Jenni Peters who teaches at North Street School in Grafton, MA. Thanks for contributing to PE Central! Posted on PEC: 1/17/2019. Viewed 9277 times since 1/14/2017.